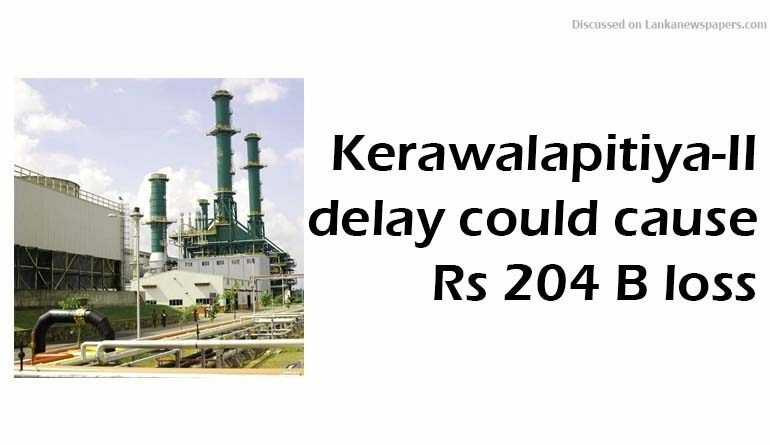 Sinister moves by the authorities to sabotage awarding the Kerawalapitiya-ii combined cycle power project to a local company could cause Rs 204 billion in losses to the State, alleged senior engineers of CEB, speaking to Ceylon FT yesterday. Furthermore, the engineers opined that it was the right of the public to know such moves which affect public life and enormously affect Government coffers. “This would be a much greater scam than the Rs 11 billion Bond scam if it goes unnoticed”, they alleged. It was brought to light that some authorities with vested interest were favouring the 300 MW Kerawalapitiya-ii combined cycle power plant to be awarded to Samsung Korea, overlooking local bidders whose tariffs were much lower. This is a definite saving of Rs 204 billion to the country; the loss could be 20 times greater than the now-infamous Bond scam. This scam is now being exposed, thanks to some concerned parties who stand against corruption, whose eyebrows were raised by the fact that Samsung, who was disqualified for non-submission of signed documents for the financial bid was considered a genuine bidder. Engineers charged that “Despite the scam under the carpet being exposed, players with vested interests lament over fairytales and keep dragging the issue without awarding the contract to the deserving bidder, which is a serious violation of Government tender awarding procedures.” According to sources, the margins between the lowest and second-lowest bidder were no less than a staggering Rs 34 billion, which is three times greater than the Bond Scam losses. At the beginning of this month, the Director General of the Public Utilities Commission of Sri Lanka (PUCSL), Damitha Kumarasinghe warned that the Kerawalapitiya Liquid Natural Gas (LNG) plant would need to be started soon if they are to keep to the CEB’s timeline of commissioning it by 2019. The PUCSL has repeatedly warned that the country will face an energy crisis soon unless they keep to the approved generation plans and implement what has been proposed. In this respect, PUCSL officially noted that delaying this essential power plant will certainly cost the country to the tune of Rs 1.55 billion per month when compared to the high cost of short- term emergency power plants required to bridge the gap. Over the last 20 years, the country has had to resort to diesel and thermal power plants to meet increasing power needs, as the long-term power plants proposed for over 20 years have not materialized in keeping with failures of CEBs project proposals. The 300MW Kerawalapitiya-II tender was floated by the Ceylon Electricity Board (CEB) as a fast-track power plant, by squeezing the time spans required for each aspect of the project. Proposals were opened in April 2017 and now a total of eight months have lapsed; the fast-track project has become an off-track project. This delay has already resulted in a loss of Rs 12.4 billion, a figure exactly close to the Bond Scam, unheeded by the public. The delaying stance adopted by the authorities is questionable as the country faces a severe energy crisis and it is time for the concerned parties to prioritize the country instead of personal gains, the engineers alleged. Meanwhile, the authorities have issued a drought warning for the March-April 2018 period, which could result in imminent power cuts.